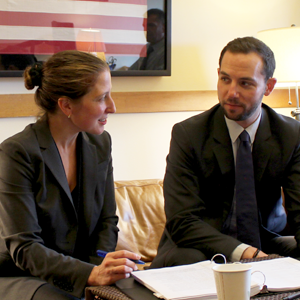 Deputy City Attorneys Sara Eisenberg and Brad Russi discuss litigation strategy on a Section 8 housing case after winning a key procedural ruling on March 22, 2016. SAN FRANCISCO (March 22, 2016)—A San Francisco Superior Court judge today rejected a bid to dismiss City Attorney Dennis Herrera’s civil action against a notorious residential landlord and an associated real estate broker for illegally discriminating against low-income residents by refusing to accept Section 8 housing vouchers. The order, entered by Judge Ronald E. Quidachay late this morning, clears the way for Herrera’s Oct. 21, 2015 lawsuit to proceed against Lem-Ray Properties, an affiliate of the once-high-flying Lembi real estate empire, and broker Chuck Post. Section 8 vouchers—so named for Section 8 of the Federal Housing Act, and also known as the Housing Choice Voucher Program—are administered locally by the San Francisco Housing Authority. The program allows low-income families to secure housing in the private rental market by requiring qualifying renters to pay thirty percent of their income toward rent, with Section 8 vouchers covering the remainder. The vouchers impose no additional costs on landlords, and landlords’ refusal to accept them violate local law. Lawyers for the defendants filed a demurrer to dismiss Herrera’s case last month, contending that San Francisco’s prohibition on landlords to refuse such vouchers is pre-empted by state law. “In the midst of our affordability crisis, targeting poor and working families for unfair treatment in housing is unconscionable. It’s also illegal in San Francisco—and I’m grateful to Judge Quidachay for an unequivocal ruling affirming that,” Herrera said. Lem-Ray is among the entities associated with the Lembi family’s once expansive CitiApartments-Skyline Realty empire, which Herrera sued in 2006 for an array of lawless business and tenant harassment practices involving at least 30 properties. The defendant, which is still subject to the 2011 civil injunction Herrera secured in his five-year litigation battle, is among the landlords memorably dubbed “the Scumlords” in an award-winning 2006 exposé by investigative reporter G.W. Schulz. Schulz won first-place honors from the California Newspaper Publishers Association in 2007 for his San Francisco Bay Guardian series on tenant mistreatment by the Lembis, who at the time were among the largest residential property owners in the city. Chuck Post, also named in Herrera’s civil suit, is a real estate broker whose ApartmentsinSF.com website and other online rental postings brazenly flouted local law by advertising that Section 8 vouchers would not be accepted as payment for Lem-Ray’s residential apartments. Under San Francisco law, property owners and real estate agents are prohibited from refusing to accept federal, state, or local housing subsidies as a form of rental payment, or to indicate in rental advertisements that housing subsidies will not be accepted as payment. Post and Lem-Ray are both alleged to have violated the local law, according to Herrera’s complaint, together with provisions of the California Unfair Competition Law that prohibit unfair and unlawful business practices. If successful, Herrera’s lawsuit could secure civil penalties against Lem-Ray Properties of up to $6,000 for each violation of its 2011 court order, and civil penalties against both defendants of $2,500 for each violation of the state Unfair Competition Law. Both defendants could also be liable for three times the amount of a single month’s rent in which the landlords charged for any unit in violation of the Police Code provision. Herrera is also seeking an injunction against both parties to bar them from business practices in violation of state or local law. The case is: City and County of San Francisco and People of the State of California v. Chuck M. Post, Lem-Ray Properties I DE, LLC et al., San Francisco Superior Court Case No. 548551, filed Oct. 21, 2015.